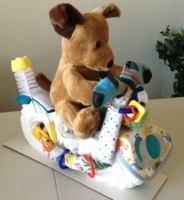 This 4 wheeler diaper cake is perfect for the outdoor enthusiast. It has1 store bought flannel 26" x 26" receiving blankets and 1 handmade flannel blanket, 35" x 41" with a folded edge to ensure years of use. It also contains 56 Size 2 diapers with a wetness indicator, 1 dishwasher basket or a package of baby wipes, a 4 oz BPA free baby bottle or sippy cup, 1 BPA free pacifier, 1 pair booties, 1 bib or washcloth puppet, and a stuffed animal. It is 14 inches long x 16 inches wide x 20 inches high. It can be themed for a boy or girl. Everything is new but taken out of original packaging. Stuffed animal and patterns of materials will vary due to availability. Selection is Designer's Choice. Customization is an additional charge. Makes a great centerpiece, shower or new mother gift! Shipping is $60 and up (depending on the zip code where it is being mailed to, weight and mailing box size) not the $7.50 that shows up in the cart. It is often displayed in the baby's room until the mother is ready to use the items included. This is also available for local pickup in Phoenix, Arizona. It will get many compliments at the baby shower! 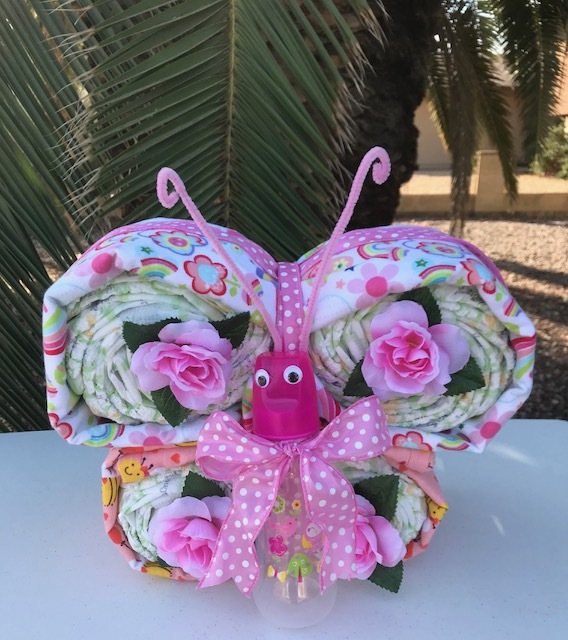 The butterfly is made with 1 store bought flannel blanket 26" x 26", 1 handmade flannel blanket 35" x 41", 32 Size 2 diapers (14 - 18 lbs. which show a blue line when wet), 1 hair bow, and 1 BPA free baby bottle. Everything is new but taken out of original packaging. Patterns of materials will vary due to availability. Selection is Designer's Choice. Customization is an additional charge. Shipping is $ 35 and up (depending on the zip code where it is being mailed to, weight and mailing box size) not $7.50 as shown in cart. This is also available for local pickup in Phoenix, Arizona. Cute and practical! 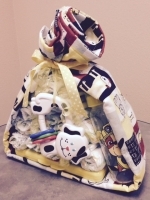 This clothesline basket is made with a soft handmade flannel blanket 35" x 41" with folded edge to ensure years of use, 18 Size 2 diapers (14 - 18 lbs. 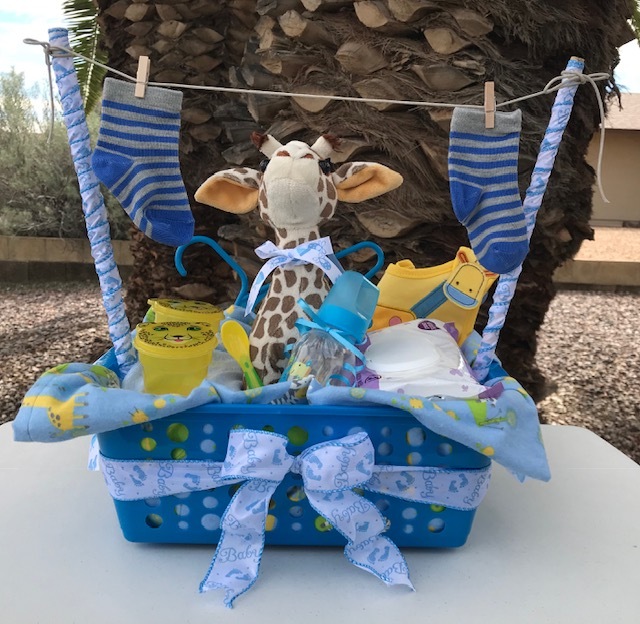 with a wetness indicator), 1 organizing basket , a stuffed animal, 1 baby washcloth,1 BPA free baby bottle, 1 pair booties, 1 package baby wipes, 2 baby hangers, 1 baby spoon, snack cups or a snack container, and 1 bib . It is 18 " tall x 15 " wide. Everything is new but taken out of original packaging. Stuffed animal and patterns of materials are subject to availability. Selection is Designer's Choice. Customization is an additional charge. It can be themed for a boy or girl. This is available for local pickup only in Phoenix, Arizona. 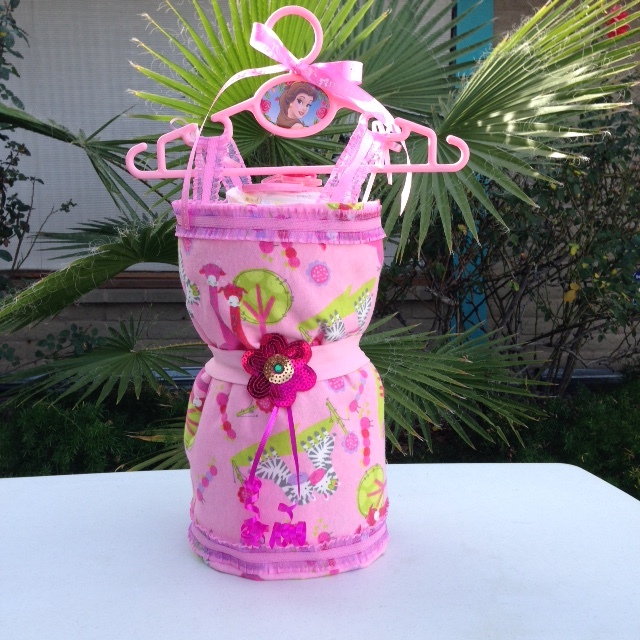 Makes a statement as a shower gift, centerpiece or new baby gift. Mothers will love it! 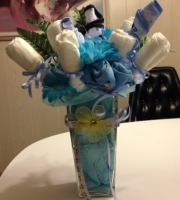 This bouquet is made from1 store bought flannel blanket 26" x 26", 14 Size 2 diapers 1(4 - 18 lbs. with a wetness indicator,) 1 onesie (3 or 6 months), 1 bib, 1 BPA free pacifier,1 baby washcloth, and a vase. Great for a centerpiece or to give to mother-to-be as a welcome baby gift! It can be made for a boy or girl. Everything is new but taken out of original packaging. Patterns and materials will vary due to availability. Selection is Designer's Choice. Customization is an additional charge. This is only available for local pickup in Phoenix, Arizona. Beautiful and practical! This dress is made with a soft handmade flannel blanket 35" x 41" with folded edge to ensure years of use, 31 Size 2 diapers (14 - 18 lbs. with a wetness indicator), 1 hair bow or headband, a baby washcloth, a disposable baby spoon, a baby hanger and a BPA free baby teether. It is 18 " tall x 8-1/2 " wide. Everything is new but taken out of original packaging. Patterns of materials are subject to availability. Selection is Designer's Choice. Customization is an additional charge. Shipping is $35 and up (depending on the zip code where it is being mailed to, weight and mailing box size) not the $7.50 which you see in the cart. This is also available for local pickup in Phoenix, Arizona. Makes a statement as a shower gift, centerpiece or new baby gift. 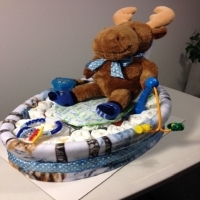 Fishing boat includes 44 Size 2 diapers, 1 soft handmade flannel blanket 35" x 41", 1 handmade burp cloth 8'1/2 " x 18", 1 store- bought blanket 28" x 28", a bib, a dishwasher basket,a spoon & fork set, 1 pair of booties, a snack cup or washcloth puppet, a bottle brush, a BPA free pacifier, rattle or teether and a stuffed animal. The boat is 16 " long x 12" wide. All items are new and unpackaged. This one was made for a hunter and fisherman father- to- be. Items will vary due to availability. The stuffed animal and patterns of materials are Designer's Choice. Customization is an additional charge. Shipping will be $60 and up (depending on the zip code where it is being mailed to, the weight and the mailing box size) not the $7.50 that prints out in the cart. This is also available for local pickup in Phoenix, Arizona. Perfect theme for the boating or fishing family! 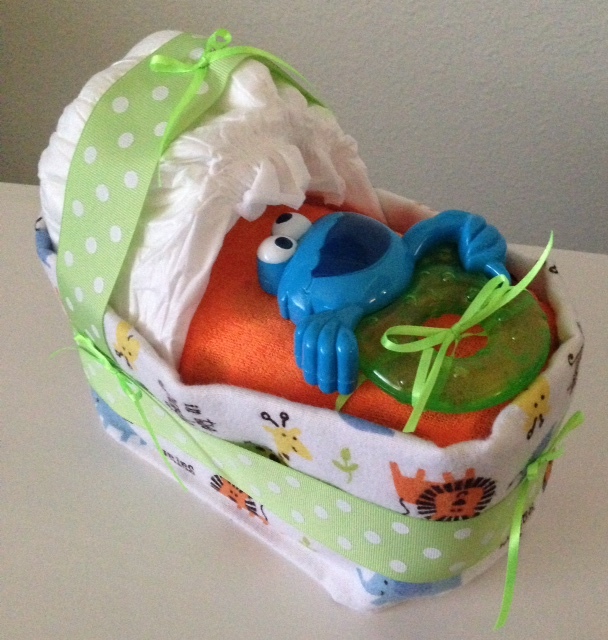 This mini bassinet is only available when a full-size diaper cake is ordered. 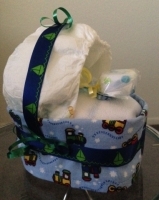 It is made with soft handmade flannel burp cloth 8-1/2" x 18" and 10 Size 1 diapers & 2 Size 2 diapers. It also includes 2 baby washcloths and a disposable baby spoon. 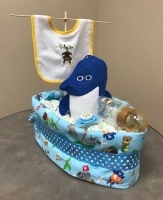 The mini bassinet is available to have a boy or girl burp cloth, matching burp cloth if a custom made flannel blanket was purchased or an "I Love Grandma" or "I Love Mommy and Daddy" burp cloth. 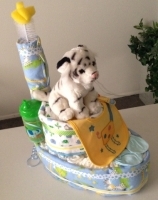 Great gift to give to Grandmas at a shower as well as the full sized diaper cake for an expectant mother. Everything is new but taken out of original packaging. Patterns of materials will vary due to availability. Selection is Designer's Choice. Customization is an additional charge. Shipping is $15 and up (depending on the zip code where it is being mailed to, weight and mailing box size) not $7.50 as shown in cart. This is also available for local pickup in Phoenix, Arizona. Cute and practical! This motorcycle is the perfect gift for a bike lover boy or girl! It has1 store-bought flannel 26" x 26" receiving blanket and 1 handmade flannel blanket, 35" x 41" with a folded edge to ensure years of use. It also contains 37 Size 2 diapers (14 - 18 lbs. with a wetness indicator), 1 pair of booties,1 terrycloth puppet, 4 teething rings, 1 bottle brush, 1 BPA free bottle or sippy cup, 1 bib and a stuffed animal. It is 17 inches long and 17 inches high. It can be themed for a boy or girl. Everything is new but taken out of original packaging. Stuffed animal and patterns of materials will vary due to availability. Selection is Designer's Choice. Customization is an additional charge. It makes a great centerpiece, shower or new mother gift! Shipping is $60 and up (depending on the zip code where it is being mailed to, weight and mailing box size) not the $7.50 that shows up in the cart. It is often displayed in the baby's room until the mother is ready to use the items included. This is also available for local pickup in Phoenix, Arizona. A practical showpiece! 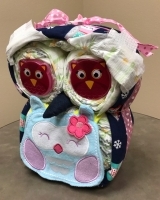 This owl diaper cake includes a soft handmade flannel blanket 35" x 41" with a folded hem edge to ensure years of use, 26 Size 2 diapers (14 - 18 lbs. with a wetness indicator), a baby washcloth, 2 snack cups with baby spoon, a BPA free baby bottle, a hair bow, and a baby bib. It is 10 - 1/2 inches tall and 9 inches wide. Everything is new but taken out of original packaging. 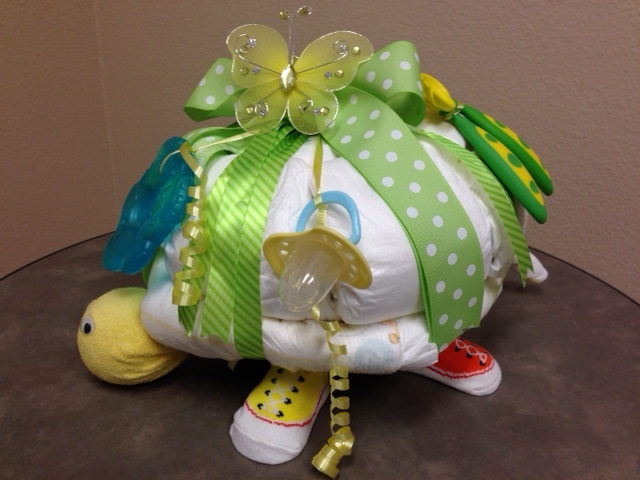 It makes a statement as a shower gift, centerpiece or new baby gift. Patterns of materials are subject to availability. Selection is Designer's Choice. Customization is an additional charge. Shipping is $40 and up (depending on the zip code where it is being mailed to, weight and mailing box size) not the $7.50 that you see in the cart. This is also available for local pickup in Phoenix, Arizona.. 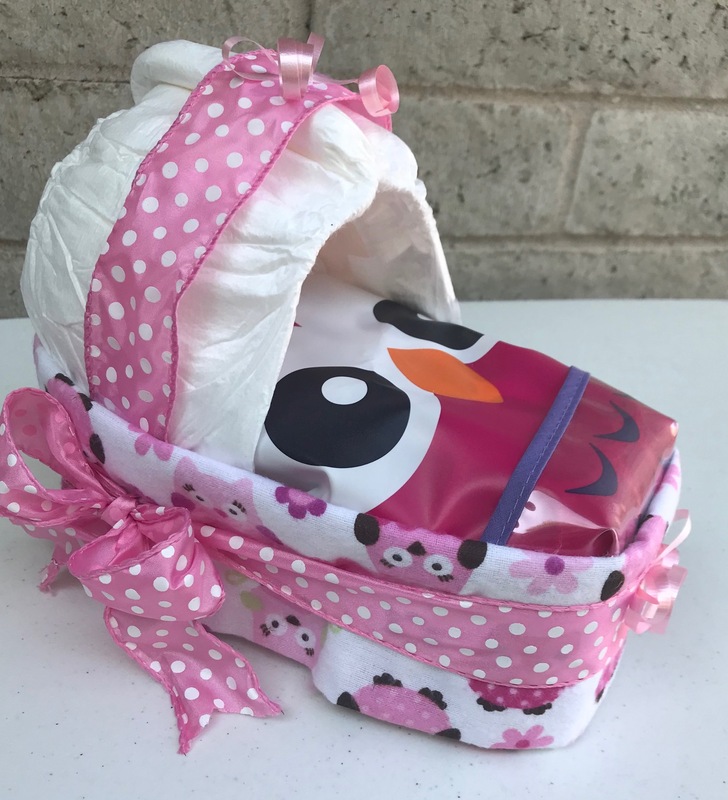 This gorgeous and practical purse diaper cake is made with 1 soft handmade 35" x 41" flannel blanket that has folded hem edge to ensure years of use, 12 Size 2 diapers (14 - 18 lbs. with a wetness indicator), and a BPA free pacifier or small hair bow. The 2 gauge flowers on each end are decorations but could be made into hair clips. 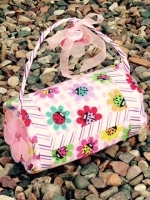 The purse body is 9 inches long and 5 inches high; with the purse handle it stands 10-1/2 inches tall. Everything is new but taken out of original packaging. Patterns of materials will vary due to availability. Selection is Designer's Choice. Customization is an additional charge. Shipping is $35 and up (depending on the zip code where it is being mailed to, weight and mailing box size) not the $7.50 which shows up in the cart. It will come wrapped with clear cellophane and ribbon tie, ready for gift giving! This is also available for local pickup in Phoenix, Arizona. Cute! This life-size sleeping baby can be made for a boy or girl. 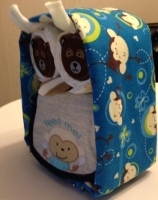 It includes 24 Size 2 diapers with a wetness indicator, a 3 or 6 month sleeper, a handmade flannel blanket 35" x 41" with a folded edge to ensure years of use, a BPA free pacifier, a BPA baby bottle, baby mittens, and a hat. It is 22"L x 8"W x 6-1/2 "H. Everything is new but taken out of original packaging. Patterns of materials will vary due to availability. Selection is Designer's Choice. Customization is an additional charge. This is available for local pickup only in Phoenix, Arizona. 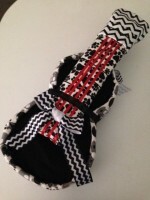 Makes a great shower gift, centerpiece or new baby gift! 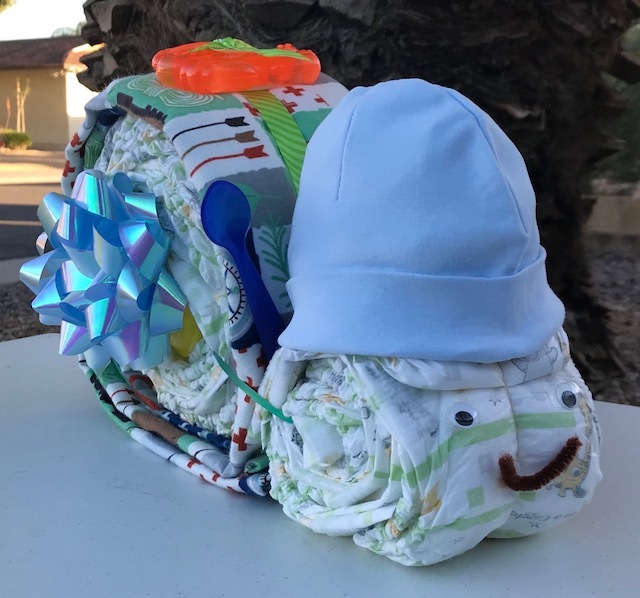 The snail is made with one 26" x 26" store-bought receiving blanket, 25 Size 2 diapers (14 - 18 lbs. which show a blue line when wet), a BPA free baby sippy cup or onesie (in the center), a hat, 2 disposable spoons, and a BPA free teether. Everything is new but taken out of original packaging. 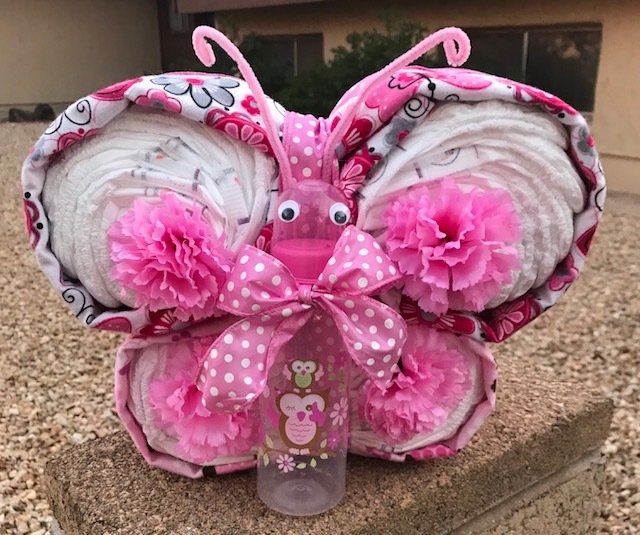 It makes a statement as a shower gift, centerpiece or new baby gift. Patterns of materials will vary due to availability. Selection is Designer's Choice. Customization is an additional charge. Shipping will be $35 and up (depending on the zip code where it is being mailed to, weight and mailing box size)) not the $7.50 that prints out in the cart. This is also available for local pickup in Phoenix, Arizona. 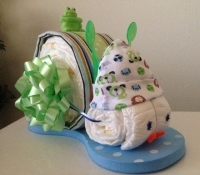 The snail is made with one handmade flannel blanket 35" x 41", 25 Size 2 diapers (14 - 18 lbs. with a wetness indicator), a BPA free baby sippy cut or onesie (in center), a hat, 2 disposable spoons, and a BPA free teether. It can be made for a boy or girl. Everything is new but taken out of original packaging. 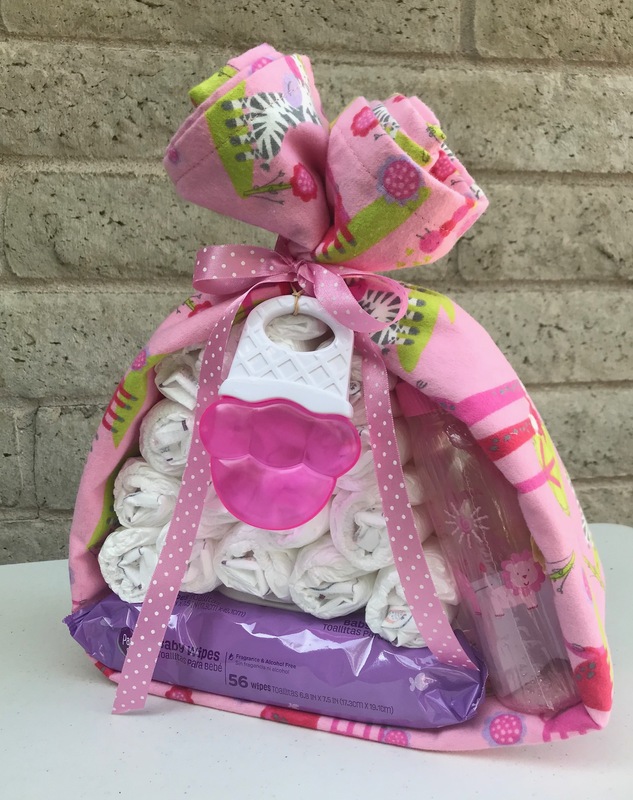 It makes a statement as a shower gift, centerpiece or a new baby gift. Patterns of materials will vary due to availability. Selection is Designer's Choice. Customization is an additional charge. Shipping will be $35 and up (depending on the zip code where it is being mailed to, weight and mailing box size) not the $7.50 that prints out in the cart. This is also available for local pickup in Phoenix, Arizona. This is my best value diaper cake for a mother-to-be. Also makes a great starter package for Grandma! The stork bundle has a soft handmade flannel blanket 35" x 41" with folded hem edge to ensure years of use. It also includes 16 Size 2 diapers (14 - 18 lbs. with a wetness indicator), a BPA free bottle, a BPA free rattle or teether and a package of baby wipes. It stands 10-3/4 inches high and is 10 inches wide at the bottom. Everything is new but taken out of original packaging. Great to give as a centerpiece, shower or new baby gift. Patterns of materials will vary due to availability. Selection is Designer's Choice. Customization is an additional charge. Shipping is $30 and up (depending on the zip code where it is being mailed to, weight and mailing box size) not the $7.50 shown in the cart. This is also available for local pickup in Phoenix, Arizona. Pretty and practical! 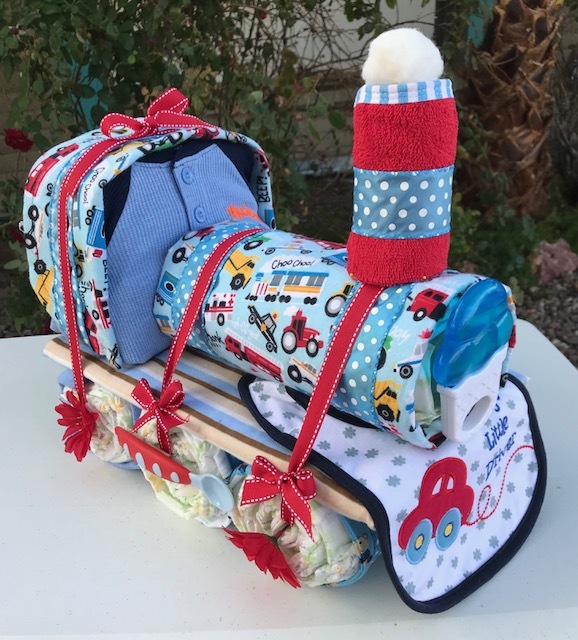 This themed diaper cake is made with a soft handmade flannel blanket 35 " x 41" which has folded hem edge to ensure years of use, 22 Size 2 diapers for 14-18 lbs. baby with a wetness indicator, a bib, a dish towel, a BPA free baby bottle, a hair bow or teether, a BPA free pacifier; and a stuffed animal. This cake is 16 inches tall and 12 inches wide. It can be themed for a boy, girl or generic. Everything is new but taken out of original packaging. 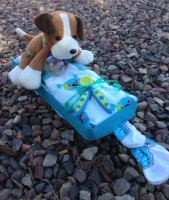 Stuffed animal and patterns of materials will vary due to availability. Selection is Designer's Choice. Customization is an additional charge. Shipping is $40 and up (depending on the zip code where it is being mailed to, weight and mailing box size) not $7.50 as shown in cart. This is also available for local pickup in Phoenix, Arizona. Cute and practical! 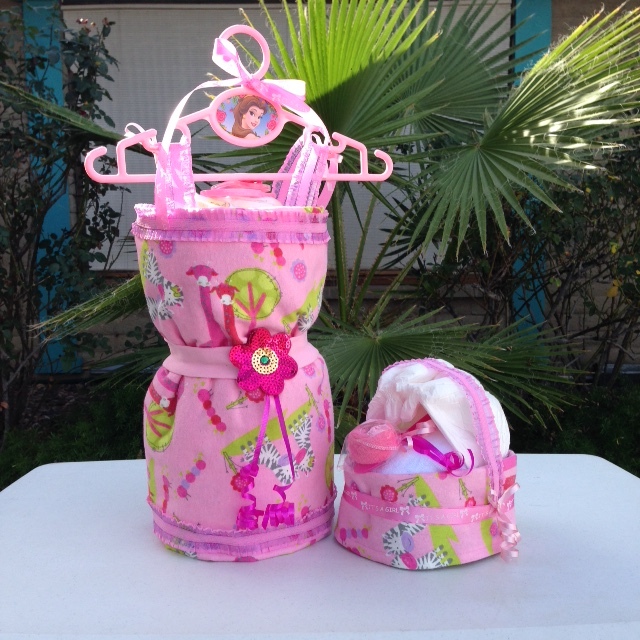 This cute diaper cake includes a soft, handmade fleece or flannel blanket 35" x 41", 14 Size 2 diapers (14-18 lbs. with a wetness indicator), 1 baby rattle/teether or baby bottle BPA free, 1 spoon/fork set, 1 pair of booties and a small stuffed animal. It is 22"L x 7" W x 13"H. It can be made for boy or girl. Everything is new but taken out of original packaging. Stuffed animal and patterns of materials will vary due to availability. Selection is Designer's Choice. Customization is an additional charge. Shipping of $40 and up (depending on the zip code where it is being mailed to, weight and mailing box size) not $7.50 as shown in cart. This is also available for local pickup in Phoenix, Arizona. Makes a great shower gift, centerpiece or new baby gift. Also a perfect gift for a new puppy! Mother will love it! 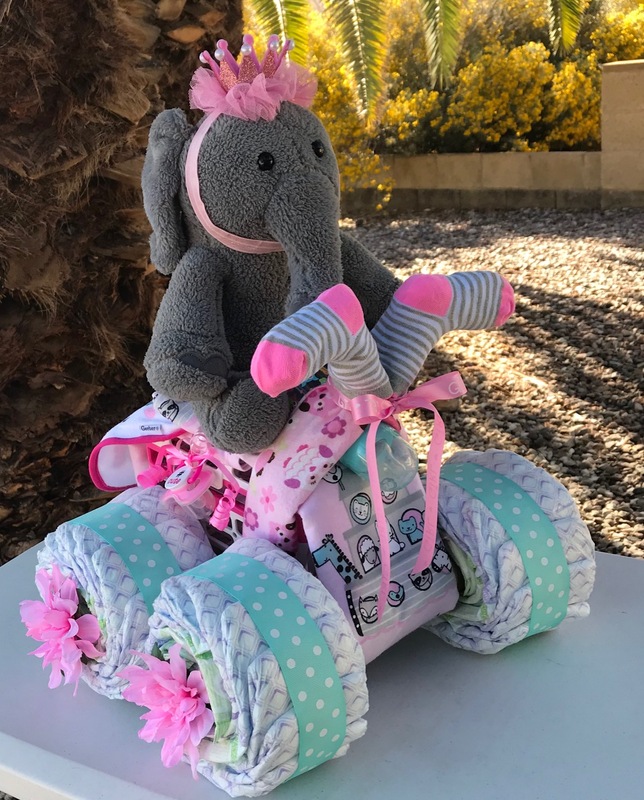 This themed diaper cake is made with a soft handmade flannel blanket 35 " x 41" which has folded hem edge to ensure years of use, 28 Size 2 diapers with a wetness indicatort, a BPA teether or pacifier and a small stuffed animal. This cake is 12 inches tall and 23 inches wide. It can be themed for boy or girl. Everything is new but taken out of original packaging. Stuffed animal and patterns of materials will vary due to availability. Selection is Designer's Choice. Customization is an additional charge. Shipping is $40 and up (depending on the zip code where it is being mailed to, weight and mailing box size) not $7.50 as shown in cart. This is also available for local pickup in Phoenix, Arizona. Perfect for the fitness enthusiast! 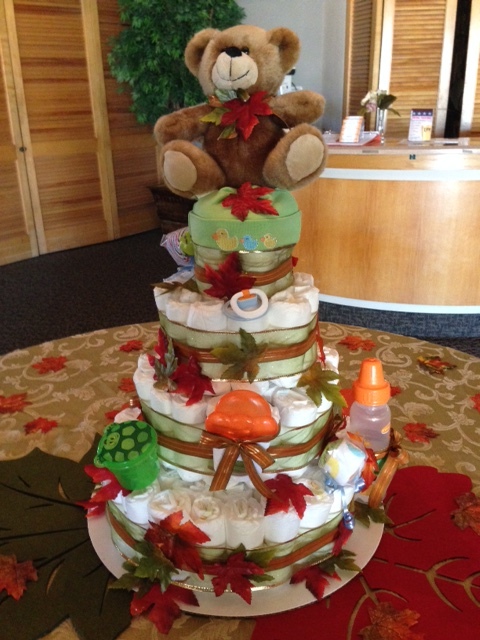 This 4 tiered themed diaper cake has 117 diapers-- 37 Size 1 and 80 Size 2 diapers with a wetness indicator. Added are various baby items such as a baby hat, a BPA free bottle, a BPA free teether or pacifier, a pair of baby booties, and a bib. The top will have a small stuffed animal or a decoration. The cake is 14 inches wide x 20 inches tall. If you want a handmade blanket, 35" x 41", add $20 to price listed. Everything is new but taken out of original packaging. Patterns of materials will vary due to availability. Selection is Designer's Choice. Customization is an additional charge. Shipping is $60 and up (depending on the zip code where it is being mailed to, weight and mailing box size) not $7.50 as shown in the cart. This is also available for local pickup in Phoenix, Arizona. Mother will love it!! This tugboat is a perfect gift for a water or sailing enthusiast! It has1 handmade flannel blanket 35" x 41", 1 matching handmade burp cloth 9" x 18 ", 34 Size 2 diapers (14 - 18 lbs. 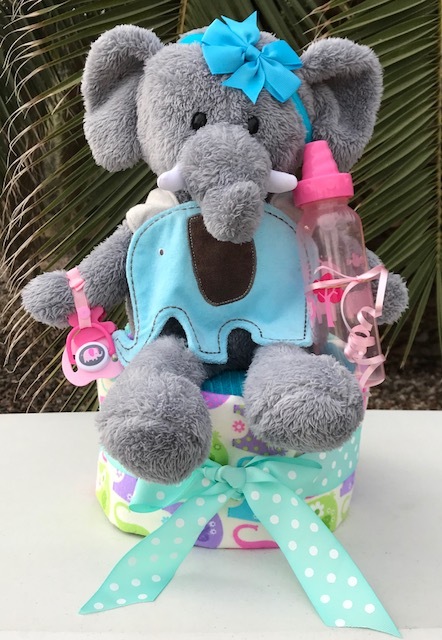 with a wetness indicator), 1 container of baby wipes, a pair baby mittens, a baby washcloth, a bottle brush with large and small end, a set of baby spoon and fork, a BPA free bottle or sippy cup, a bib and a stuffed animal. It is 15 inches long, 9-1/2 inches wide and 20 inches high. Everything is new but taken out of original packaging. Stuffed animal and patterns of materials will vary due to availability. Selection is Designer's Choice. Customization is an additional charge. It can be made for a girl too! Shipping is $50 and up (depending on the zip code where it is being mailed to, the weight and the mailing box size) not the $7.50 that shows up in the cart. It is often displayed in the baby's room until the mother is ready to use the items included. This is also available for local pickup in Phoenix, Arizona. A practical showpiece!